66.67% of people buy Getting Lucky and Lucky in Love ~ Paperback / softback ~ Carolyn Brown. 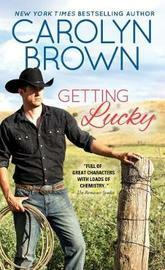 CONTEMPORARY COWBOY ROMANCE A fresh start is exactly what Julie Donavan needs. So imagine her dismay when her new next-door neighbor is the twin brother of Graham Luckadeau, the soldier who fathered her child after a one night stand six years ago... Ever since Graham passed, Griffin has stayed focused on running the ranch. The last thing he needs is a distraction from the woman who moved into the feuding ranch next door. But when his daughter insists she wants to be friends-or better yet, sisters -with the girl who looks like her twin, the sparks begin to fly. New York Times and USA Today bestselling author and RITA Finalist, Carolyn Brown, has published more than seventy books and sold over half a million copies. She and her husband, a retired English teacher, make their home in southern Oklahoma.